Crazy storms and grey weather inspired me to take the kids on an adventure Saturday morning. The Mister was in Victoria and the idea of being housebound due to cold and rain did not appeal. We were planning on going to Nanaimo later that evening, so instead of twiddling my thumbs with two whiny tots, I organized a trip up island on the E&N Via Rail train. Our generous neighbour drove us to the station with a car full of bags, car seats, and teddy bears. I anticipated delays, like last-minute potty trips, and even then we were 35 minutes early. As I read the hand-written rules for buying tickets stapled to the wall of the vacant station house, a man approached, opened the waiting room (with a clean toilet furnished with toilet paper!) and left. You’re not in London anymore, I thought. No queue for tickets, no navigating large crowds and a clean toilet — with loo roll! A long 45 minutes later, we heard the train’s whistle in the distance, on its way north from Victoria. “It’s coming!” my cold three-year-old shouted. Both children were vibrating as the train approached; the eldest from excitement and the youngest from dread. I picked up the youngest, the bags and the car seat to board the train. I was a little nervous taking so many belongings with me until I noticed a women disembark holding a child, bags and a car seat. Oh good, I thought, I’m not the first. The conductor kindly helped with the carseat and we found ourselves the only seat available with a big window, which was, unfortunately, behind a grumpy lady who the conductor had minutes before refused to let off the train for a quick cigarette. On the up side, the air didn’t stink of stale nicotine; on the down side, I had two excited kids behind a grumpy lady. The inevitable happened: my eldest bonked her head on the back of GL’s chair. GL rose slowly, looked back with disgust and informed us that she hadn’t slept in two days so could the children please not kick the back of her chair. Five minutes later, she moved seats. Relief. Just like the olden days riding in the very back of the family station wagon, the girls were delighted with their new freedom of no seat belts and lots of space. 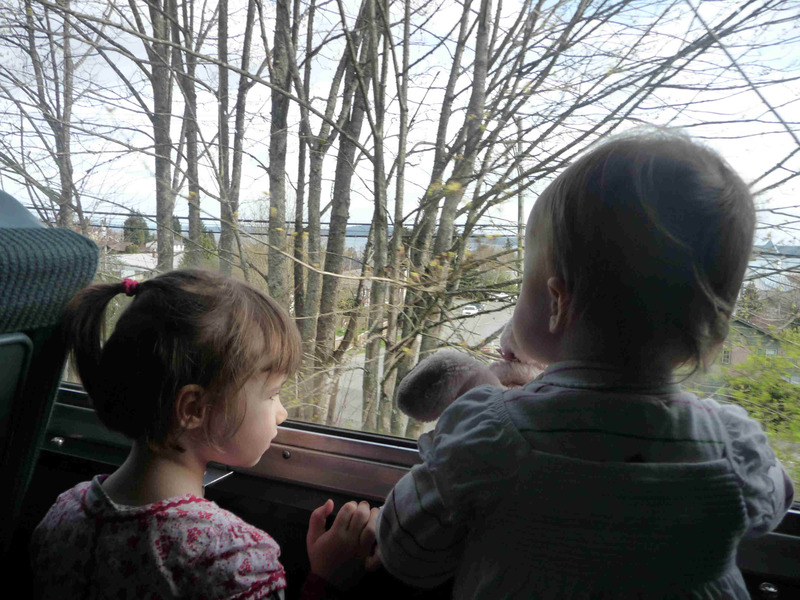 For most of the trip their noses were pressed against the window, especially after Chemainus when the landscape included more buildings and people than trees and rivers. Everytime the train approached an intersection, it blew its whistle, at which point my youngest would look up in surprise at say,”Oh! Train!”, as though she didn’t know she was on the train that was blowing the whistle. With no stress (grumpy lady aside) and no seatbelts, we will ride the rails again soon. I’ve promised my husband (promised him for Father’s Day last year!) we’d go and I’d arrange it….this is too simple and fun….I think we’ll even go to the end of the line!